As a massive fan of the original, I was a little anxious when I first heard that Ni no Kuni II: Revenant Kingdom wasn’t going to have the same level of involvement (or, indeed, any involvement) from Studio Ghibli as the first DS version or Wrath of the White Witch on PS3. But now that I’ve gotten my hands on the game at E3, I can safely allay the fears of those who might have had similar anxieties — this game is in phenomenal hands at Level5, and seeing the gorgeous animation in action (let alone having a blast with the demo) was pretty much all I needed to have this title make its way up to that shining top shelf of my most-desired list (a spot it currently shares with Beyond Good & Evil 2, Super Mario Odyssey and Vampyr, just in case you’re curious). With that said, though, I should mention that while it retains all the Ghibli-esque charm and wonder that made the original such a delight, there are a lot more differences under the hood — the vast majority of which I find highly positive changes, but as always, other players’ mileage may vary. 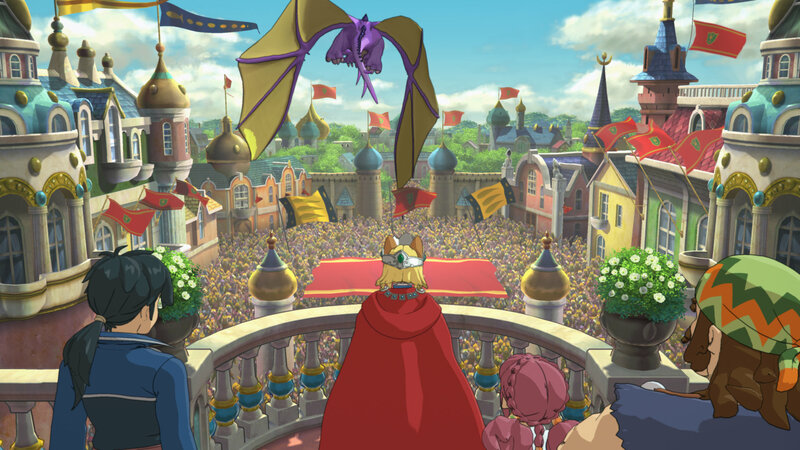 I’m still not quite sure where exactly Ni no Kuni II sits relative to the first game timeline-wise, outside of being a sequel; all I’m sure of is that, with lead character Evan Pettiwhisker Tildrum (and what a spectacular name that is) being king of returning location Ding Dong Dell, it at least shares a world with Oliver and Drippy’s early-2010s adventure. The E3 demo I played entailed a boss battle against a massive HP sponge (er, dragon) named Longfang, which did a fairly good job of showcasing both the audiovisual spectacle of the adventure, as well as the new battle mechanics. As far as the former goes, I don’t think I need to tell anyone who’s seen the trailers for this game that it improves upon the jaw-dropping gorgeousness of the original: as you might imagine, that’s no small feat (even if the PS3 version was technically a port of a DS game). Ni no Kuni II takes full advantage of the PS4 hardware, offering a smoother framerate, much greater textures and draw distances, and some truly spectacular-looking character models. More than ever, it really does look as though you’ve stepped inside a 3D Ghibli movie … and if you grew up with the whimsy of Hayao Miyazaki, Toshio Suzuki and Isao Takahata’s work like I did, it’s enough to bring a few tears to your eyes. Oh, and it’s worth mentioning that the appeal isn’t limited to the visuals, either. In a move that’s sure to make many fans sigh a huge breath of relief (as I did), veteran Ghibli composer Joe Hisaishi has returned to score this second entry in the series … and what I was able to hear of his work over the din of the show floor (because, unfortunately, no headsets were available at the demo stations) was, of course, excellent. Whether it will be able to match the pure wonder of his themes for towns like Hamelin and Al Mamoon is up for debate until the final release, but if anyone can outdo his own great work, it’s Hisaishi. What, then, of the gameplay? Well, as I mentioned before, Ni no Kuni II represents a complete departure from the combat system of the original, which involved creature collection and raising a la Pokémon, with a mixture of turn-based and action elements. The sequel goes all-in on the action, and the moment I started controlling Evan in battle, I felt it was an improvement. I always felt like the battle system in the first game was one of its weaker elements; it was rather slow and repetitive, especially with a monster collection system that relied on randomness (if you played Wrath of the White Witch, I’m sure all manner of frustrating memories are flooding back to you now). So yeah, my excitement was palpable when I discovered how much faster and more responsive the combat seemed to be in this game. “I can jump!” I shouted at one point, causing several people standing by in the Bandai Namco booth to laugh. Needless to say, things are a lot more involved this time around: positioning and dodging are now extremely important, and battle is a blend of hack-and-slash with your main weapon and magic that’s mapped to a set of hotkeys. But for those who might miss the little creatures fighting alongside you, don’t worry … that’s what the adorably-named Higgledies are for. These little sprites are a lot more autonomous than the ones in the original game; they mill about while you’re taking care of business elsewhere, then join up in formation sometimes so you can trigger a special power. For example, some of the Higgledies create an area of effect where you’ll be shielded from damage, others attack nearby enemies for you, and still others heal any party member in range. Unlike the party-member creatures from the first game, their presence feels a little less vital to the flow of combat, but I’m sure using their helpful abilities effectively will be key to winning many battles. 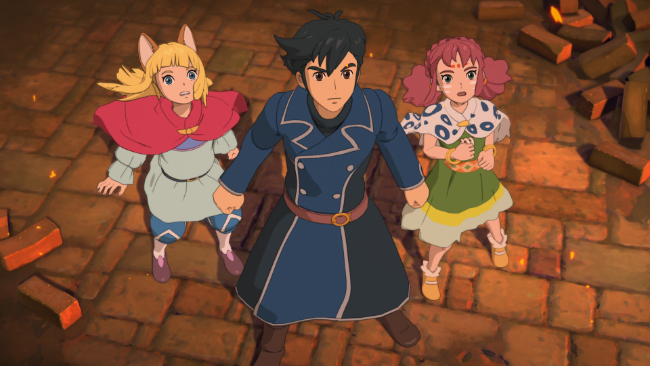 Ni no Kuni II: Revenant Kingdom is looking like it’s going to be a can’t-miss title for a certain subset of gamers when it launches on November 10 exclusively for PS4. Whether you played and enjoyed Wrath of the White Witch or you don’t yet have any experience with the series, if you enjoy Ghibli movies or Japanese RPGs, this is one to keep a close eye on.